Hey people, I was having a problem after installing a new PSU and GPU where I would get No Signal on my monitor, and I messed about with it for hours and thought, I'll just try reverting everything back to how it was. But I was still getting the No Signal message on my monitor. So after a few days of seeking help I came to the conclusion my motherboard was busted, went and bought the exact same one (ASUS M5A78L-M/USB3) and installed it this morning. Annnnd I still get the No Signal message even when not connected via HDMI from the Video Card ( EVGA GTX 960) and connecting through the motherboard itself. Please help me, I've been without my computer for too long now. First things first, you will have to use either VGA or DVI/DVI-D as HDMI won't be compatible without drivers. 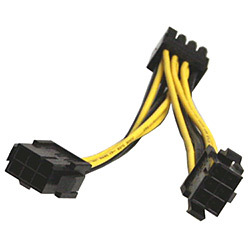 Second you need to connect that VGA/DVI into the graphics card, when a graphics card is installed in a PCI-E slot it automatically disables the input on the motherboard. If you connect through the Graphics card you should have no problem with signal, if you do check cables / Monitor with a second device. I don't have the right cables to do so, would it work if I took the Graphics card out and tried VGA to VGA through the motherboard? Edit: I should also note that I was told to try connecting my keyboard to the pc and press the caps lock button to see if it turned on to show a successful boot. I tried this and the light on the keyboard doesn't turn on, implying there is a problem with the booting process? Edit2: I found an adapter to allow me to use the DVI on my graphics card into a VGA then into my monitor but I'm still getting no signal, I'm guessing there's another part of the PC that's failing the boot up process? Guys, is there a way for me to diagnose what's causing the boot failure cause I think that's what is happening here. Hi Calvin, Sorry have been away for awhile. No display while booting is going to be pointed in 2 directions, Is your PC booting? or is it shutting of after 5-10 seconds etc? If your machine is booting then shutting off, take the heatsink off your CPU and make sure it is seated correctly, make sure that the CPU is in the socket correctly aswell. Try these out and let me know. Is it true that you can tell whether the PC is booted by pressing the CAPS LOCK key on my keyboard to see if it lights up? Because I tried that and the light won't turn on. Tried the RAM in another slot and no luck. One thing that I have noticed is that the stick won't fully push into the slot, like it feels like if I carry on pushing, it's at the point where it's gonna snap or break the slot. And the clips on the top and bottom to hold it into the slot don't close properly. Okay the RAM isn't seated properly, both clips should snap into position the in cutout's of the RAM. What Motherboard do you have and what RAM have you got? It could be that your motherboard is DDR2 and your trying to insert DDR3. Can also be a cause of Speeds but different speeds wont change the size of the RAM. Do you have drivers installed or is this a fresh card? 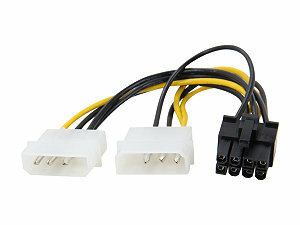 oh right, is it an adapter like this : http://www.avadirect.com/images/items/MSC-ADR-26PPCIE8PPCIE.jpg and youre saying only 1 6 pin is connected from the psu? Do you still have 7700 drivers installed? [SOLVED] Do I need to format my hard drive to install a new motherboard and cpu? The pins on my motherboard are too thick for the fan connectors on the pre installed 3 front fans to fit onto them. Install NH-D15 before or after motherboard is in the case?